The public is to be consulted on plans to make an illegal travellers site in Haldon Forest near Exeter permanent. Devon County Council is considering selling the land to Teignbridge Council so that social housing group Teign Housing can improve the site. 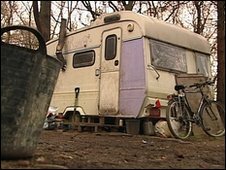 About 30 travellers, many of whom have children at local schools, have been living on the site since 2002. Teign Housing said it would be consulting local people on the proposals. Mike Hanrahan, chief executive, said the site could include hard standings and amenities such as electricity, water, showers and toilets. "These things can be contentious, but the site has been in existence for quite a period of time and a number of residents are quite integrated into the local community. "People will get the opportunity to get their views known when planning applications are submitted. "There is a long way to go before we identify numbers and what the actual facilities will be."